HELP OUR Veterans TO SAVE THEIR LAND by Taking Action RIGHT NOW. Write, Call, Fax and let the servants of the people know that treating our Veterans with disdain will NOT be tolerated. Keep them on speed dial, share the numbers below with your friends, share this webpage with you e-mail list, call into talk radio and speak of this. If you are local to Los Angeles show up on Sundays and stand with our Veterans as they protest their property being stripped away from them. We need YOU to make the American public aware of what greedy politicians and businesses are doing to our Veterans. IT IS TIME TO HELP THEM NOW! Did you ever have an encounter with a thief? If not, how many times have you read or heard about their sudden attacks in newspapers or TV and thought or gasped, ‘I hope that never happens to me’? You decide this may be a good time to put a burglar alarm in your home. Well, I learned something not too long ago; most thieves in the night are people we know. It could be a friend, a boss, a family member, your TV, but most often it is those we elect into political office: the very people who are supposed to work for us and protect our interests. And all the burglar alarms in the world will not stop them since they do not detect them. I know one is not supposed to carry a civil discourse in this manner but we have come to a time in history were we must now speak or our tongues may be silenced for a long time. As I write this, we have politicians all over the country stealing from us. Many of you are now more than aware of this new Cap and Trade bill brought to us by ‘our’ representative in the 30th district of California Mr. Henry Waxman. Well, you may also want to know that Mr.Waxman has been quite busy these days not only by promoting the biggest tax in the history of the USA but also by helping to give away land he does not own. Whose land? The land of our revered Veterans, that’s whose land. This land is slowly being doled out to special interest groups that benefit Mr. Waxman and his friends also known as the “Westside Political Machine” Sadly, he is not the only one doing this; politicians all over the country are ‘giving’ land they do not own to special interest groups. Eighty-five acres of Veterans lands were just annexed in Chicago. Where did it go to, who got it? So, let’s start with a little history on Veteran land here in Los Angeles in Henry Waxman’s district, to get the big picture of what is happening all over this country. 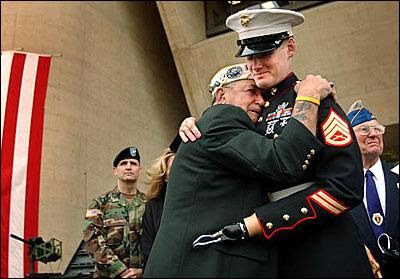 Veteran land is land that has been deeded to the Veterans to take care of their physical and emotional wounds. One of these lands the West Los Angeles Veterans’ Home (WL VHA) the largest parcel on land for Veterans in the USA, was donated by Arcadia de Baker and John P. Jones in 1888 to the Government for the sole purpose of providing permanent care to our Veterans. Arcadia de Baker kindly donated 388 acres in West Los Angeles, to Veterans and our Veterans ONLY. At that time, the hospitals on the land were providing care to the returning Civil War Veterans and to emphasize the intensity of suffering they were called asylums. What Arcadia de Baker realized was that the peaceful and isolated land was perfect for healing the physical and emotional wounds of people who served their country. What Arcadia de Baker did not know, though, that in time this isolated land would end up in the middle of one of the most affluent areas in this Country. The WLA VA is the largest Veterans Healthcare Center in the Untied States. It also just happens to be located in an area that is considered the Fifth Ave of California, a place with multi-million dollar mansions and fancy condos. So, being prime real estate many are vying for it. Now, I ask you, who is more deserving to own this land than our Veterans? Men and women we as Americans honor with all our hearts. But as we honor them, many politicians and appointed bureaucrats at the Veterans Administration (VA) are using their power to hurt them. In Henry Waxman’s district in Brentwood, homeless Veterans sleep outside the gates of their own land while TV productions rent empty hospitals that neither the VA, nor Waxman will open for our Veterans claiming that the buildings are damaged. Yet, these damaged building that are rented to TV show “Grey’s Anatomy” among others net seven-million pre year. Now would they rent damaged buildings for seven million a year and let celebrities work in? No way. The celebrities insurance would never allow this to begin with. So why are they not fixing them for our Veterans, certainly 7 million would be enough, yet not only are these building continued to be rented to Hollywood, but there is NO account to where that money is going. Rees Lloyd, a Vietnam-era Veteran and a member of the American Legion, compares the way VA treats the Veterans to the way The Bureau of Indian Affairs treated Indians. “Every agreement and promise can be dismissed at convenience”, says Rees. Mr. Lloyd, a lawyer by profession, who represented Cesar Chavez and Farmers Workers Movement for many years, has joined ‘We the Veterans’ in their attempt to save the land. Recently, in accordance, with the Flag Code of the Untied States, the Veterans decided to turn the flag upside down as a sign of distress. In return the federal police almost arrested them for ‘disturbing’ conduct! 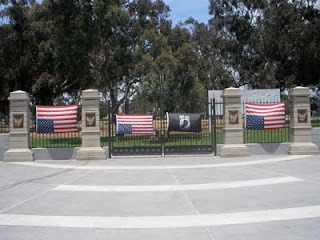 Terrorist like Bill Ayers can stomp the flag, anarchists can burn flags on the steps of the Congress, paint on flags, rip flags, put flags in dung and call it art but our Veterans who fought for what the flag represents, cannot, in accordance with the law, hang the flag upside down as a call of distress. Something is very wrong with this picture in America. Right now in history we have a group of renegade politicians who have buried our Constitution under the structure of false laws that we must abide by. ‘Laws’ that allow them to steal in the dead on night without being caught in the morning. And make no mistake about it; if they can steal our Veterans land without blinking an eye, they will soon be able to steal your land. These ‘thieves’ work on people’s minds having them believe they are spotless humans whom do no wrong. Their abuse is silent and ‘lawful’. It is always for “our good”. Hook up with an abuser with a slick intellect and you are done in. Hook up with a slick abusive politician and your country is done in. Our founders fought a long battle to give us freedom, we are not going to let them just steal it from us. And the first place to start is to stand with our Veterans and help stop this land grab. Call your representatives, write your senators, show outrage, demonstrate with your fellow Veterans but do not allow this to go on any more. Their land is your land in many ways, for without these good people freedom would be just a word. This is disgraceful. Where is the MSM. I think we all know. Not reporting and standing idly by while our freedoms are taken away one by one, slowly but surely. Everyone that is a veteran, related to a veteran or friends of a veteran should be up in arms over this. Thanks to Theodore’s World for posting this, pleas give them a visit. Visit the original post and a lot more at Veterans Landgrab. Look to 2010 and 2012 to rid this country of this corrupt administration and congress.